"A classic French dish gets a modern update with the help of your barbecue and a splash of Heinz Chili Sauce. Although this recipe is simple enough to make any weeknight, it is also impressive enough to serve to guests." Cut a pocket in the side of each chicken breast. Season inside and out with salt and pepper. Blend chili sauce with onions and brush half inside each pocket. Fill pockets with equal amounts of ham and cheese. Stitch pockets tightly closed using toothpicks. Preheat grill to medium high and grease lightly. Stir butter with olive oil, cider vinegar, honey and thyme. Brush chicken all over with some of this mixture. Set the chicken on the grill and reduce the heat to medium. Grill the chicken, covered, for 8 to 10 minutes. Turn and brush with remaining glaze. Grill, covered, for 8 to 10 minutes longer or until cooked through. 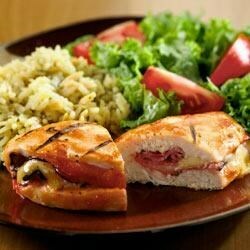 See how to make chicken cordon bleu in a creamy white wine sauce. Twist 1: For an appetizing presentation, slice chicken breasts on an angle so that the filling shows; fan slices out over rice pilaf or mashed potatoes. My family loved this! My three year old, who is very picky, just gobbled this one up. I also would add more cheese next time as it seemed to get lost in the other ingredients. Next time I would not use the Hientz chilli sauce. The flavour did not seem to go with the rest of the ingredients. Great flavor & easy to do. Needs more cheese? I really liked this, I followed the recipe in all aspects but I used a BBQ sauce that I use on my other BBQ. All in all it was very good and everyone loved it. Didn't use the BBQ, but on the stove and followed the directions. Even used the left over pan juices on top of steamed green beans and even they were delicious! I loved it! Used bottled bbq sauce after grilling it was great!